Art Deco began as a creative current that focused expressly on the French tradition, but a 1925 exhibition introduced the appealing style worldwide, and the United States seized upon it. New York’s Museum of Modern Art bought many items from the exhibition, and department store Lord & Taylor held a similarly themed show in 1928. André Vera was an early proponent of Art Deco, before the famous exposition that gave the style its name. In 1912, his manifesto Le Nouveau Style sounded the call for bold colors to take the place of Art Nouveau’s pastel shimmer. Jewelers such as Georges Fouquet, Jean Fouquet, Louis Cartier, Raymond Templier and Gérard Sandoz led the charge for Art Deco motifs in the domain of jewelry, sweeping away floral and organic motifs for an emphasis on strong contrasts and colors. Though the sources were myriad, these pieces soon coalesced into a distinct jewelry look, and did away with what their creators saw as the naturalistic excess of Art Nouveau jewelry. 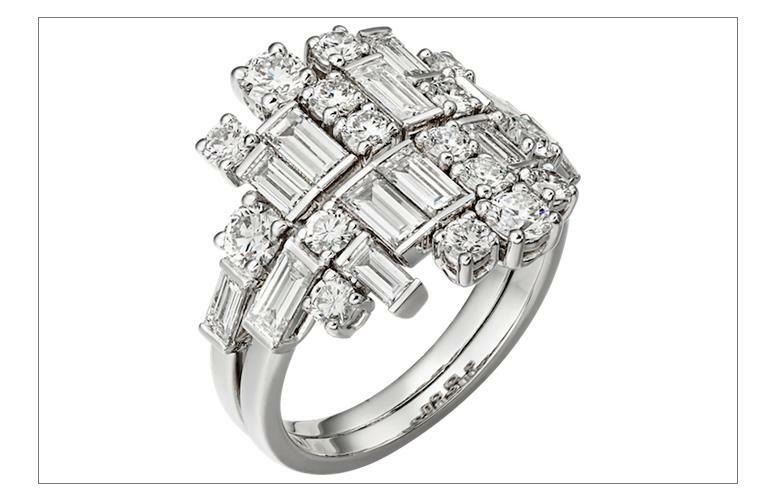 Art Deco jewelry focused on abstraction and the relationship between color and form. Sparkling diamonds and transparent expanses of rock crystal abutted opaque stones such as onyx or coral, creating a striking look that popped even from a distance. Sharp angles and geometric forms ruled the day, and when we picture the dominant fashions of the 1920s, it is still the forward-looking Art Deco that we see in our mind’s eye. In fact, this movement, nearly a century old now, still influences a wide swath of today’s top jewelers. This simple choker from Sutra uses a minimalist design and clean lines (or more precisely, one clean line) to emphasize the beauty of the extraordinary square-cut Colombian emerald, weighing 7.5 carats, at its center. Crafted in 18-karat black gold and set with 3 carats of diamonds, the piece relies on the purity of color and form to craft a look that will always read as modern. The use of rock crystal took off in the Art Deco movement, offering as it does the ability to create an unbroken transparent surface with more flexibility (and less exorbitant prices) than diamonds. The dreamy, ethereal quality of this David Webb bracelet underscores rock crystal’s appeal. Matched with platinum, brilliant-cut diamonds (6.75 carats total) and a subtle touch of black enamel, the piece underscores the timelessness of David Webb’s designs and their influences. This stunning set of high-end jewelry earrings from de GRISOGONO takes the geometric simplicity of Art Deco to an elegant extreme. 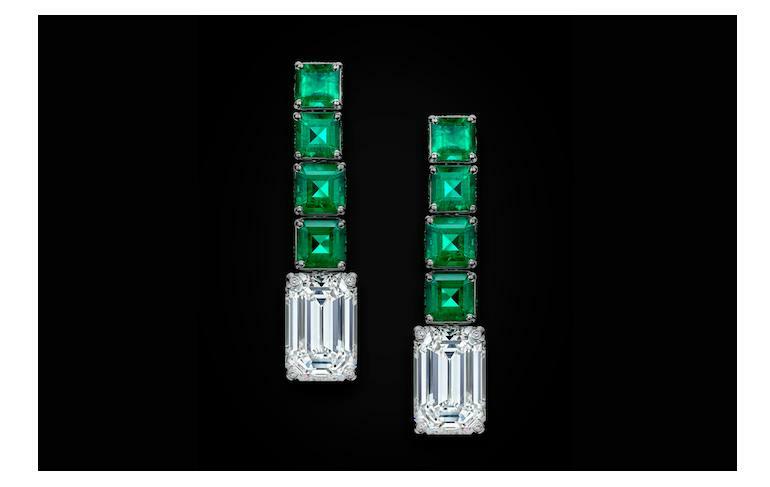 A pair of emerald-cut white diamonds (4.66 carats and 5.17 carats) descend from a total of eight emerald-cut emeralds (5.03 carats total), highlighted by 112 emeralds (0.31 carat) and white diamonds (0.22 carat). Colored stones took pride of place in Art Deco, mostly cut simply to showcase the quality of the gems. This ring from TAKAT carries on that tradition, with a 17.18-carat Colombian emerald in pride of place, flanked by trapeze-cut diamonds weighing a total of 6.47 carats.